Proper sleep is one of the basic way to a healthy living. Though it appears very simple to have a restful proper sleep pattern but in reality its actually one of the most difficult things people face specially those with stressful life schedules, activities, job and their business challenges. People compromise with their sleep knowingly and unknowingly both in order to meet and fulfill their job requirements which in long run becomes a disorder called as Insomnia. Lets take an easy effective step to deal with this problem if not cure it completely with this mineral - Melatonin. 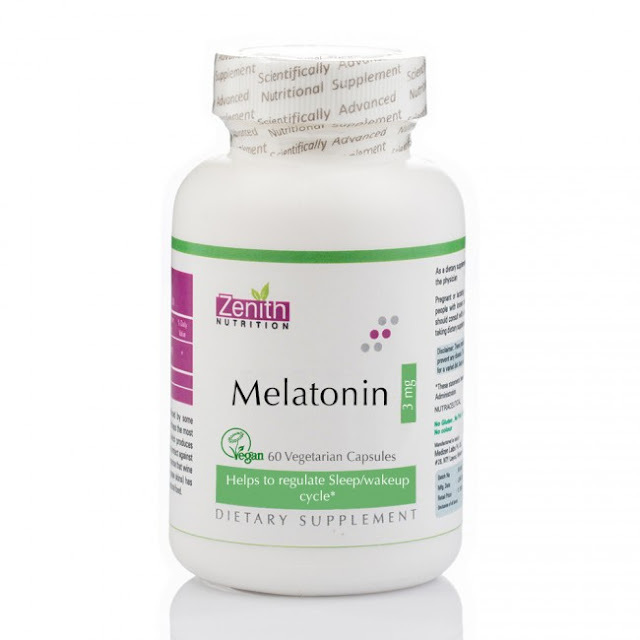 There are different ways in which you can deal with Insomnia like changing your lifestyle, eating habits, walking sleeping patterns and also adding different vitamins and minerals to your diet to regulate your sleeping patterns, one such mineral is Melatonin. 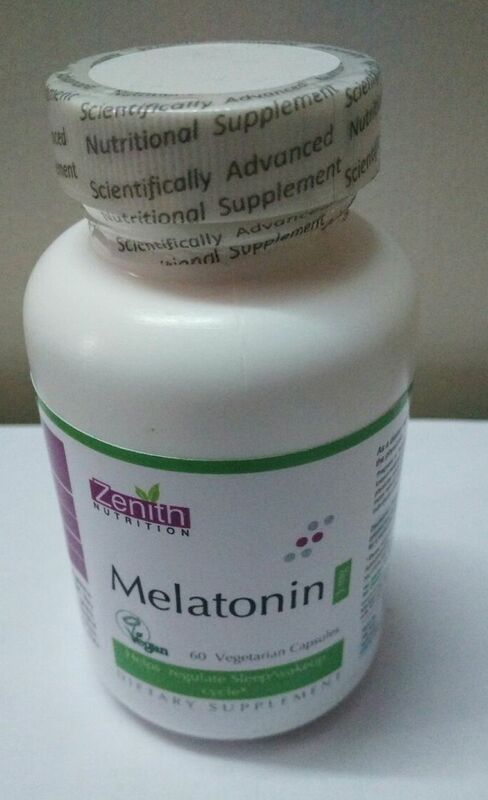 Zenith Melatonin Capsules Price - Rs 1295/- for 120 capsules. Directions: As a dietary supplement, take1 capsule daily with meal or as directed by a physician. Warnings: Pregnant or lactating women, diabetics, hypoglycemics, and people with known medical conditions and/or taking drugs should consult with a licensed physician and/or pharmacist prior to taking dietary supplements. Melatonin is a potent hormone and its long-term safety is not established. Melatonin should only be taken with medical supervision. Zenith Nutrition Melatonin helps establish normal sleep patterns to promote a more restful, relaxing sleep and better overall health. Many times all of us go through stressfull situations in life and that time imporper sleep adds to the problem, aggravating the situation even more. Its always better to opt for natural methods to overcome our sleep disorder like doing some lifestyle changes, changing our eating patterns and adding deficient vitamins and minerals in our diet and Melatonin works well when it comes to proper sleep. Nothing can be better when you can opt for a natural organic form of same like Zenith Melatonin, so that you get the utmost benefit without any side effects. 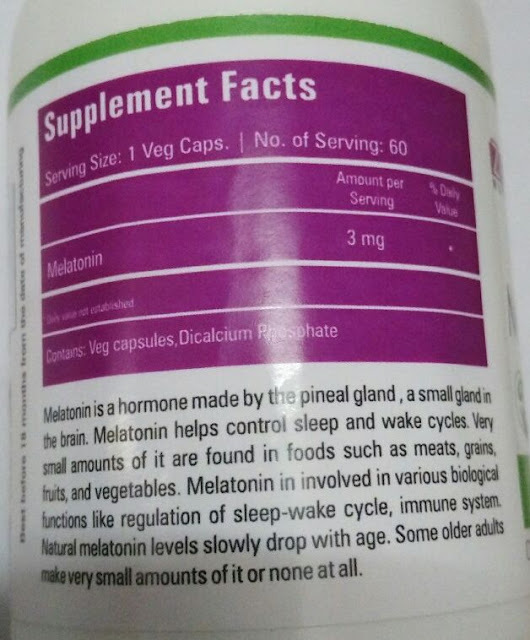 Alomg with adding Melatonin, one can do some of the following changes in life patterns for extra health benefit. Caffeine is a stimulant. The effects of caffeine can last up to 20 hours, so some people will have disturbed sleep patterns even when their last cup of coffee was in the morning. Besides regular coffee, black tea, green tea, cocoa, chocolate, some soft drinks, and many over-the-counter pharmaceuticals also contain caffeine. Doctors sometimes recommend eating a high-carbohydrate food before bedtime, such as a slice of bread or some crackers. Eating carbohydrates can significantly increase levels of a neurotransmitter (chemical messenger) called serotonin, which is known to reduce anxiety and promote sleep. A steady sleeping and eating schedule combined with caffeine avoidance and counseling sessions using behavioral therapy has reduced insomnia for some people. A naturopathic therapy for insomnia is take a 15- to 20-minute hot Epsom-salts bath before bedtime. One or two cups of Epsom salts (magnesium sulfate) in a hot bath are thought to act as a muscle relaxant. Herbal remedies have been used safely for centuries for insomnia. In modern herbal medicine, the leading herb for insomnia is valerian. Valerian root makes getting to sleep easier and increases deep sleep and dreaming. A combination of valerian and lemon balm has been tested for improving sleep. Chamomile, hops, passion flower, lemon balm, American scullcap, and catnip are commonly recommended by doctors. These herbs can also be used alone as mild sedatives for those suffering from insomnia or nervous exhaustion. Chamomile is a particularly good choice for younger children whose insomnia may be related to gastrointestinal upset. Hops and lemon balm are approved by the German government for relieving sleep disturbances. The volatile oil of lavender contains many medicinal components, including perillyl alcohol, linalool, and geraniol. The aroma of the oil is known to be calming and thus may be helpful in some cases of insomnia. Internal use of essential oils can be dangerous and should be done only with the supervision of a trained herbalist or healthcare professional. Acupuncture may be helpful for insomnia, possibly by increasing production of calming neurotransmitters such as serotonin and other substances.The treatment of insomnia with auricular (ear) acupuncture may provide similar benefits to people with insomnia, according to a preliminary trial.